Cereal lovers, you know how Kellogg’s Raisin Bran boasts about having “Two Scoops of Raisins!” in every box? That’s because Kellogg’s knows most of you like the raisins a lot more than the bran flakes, so they capitalize on their product’s yummiest feature. Certain blues rock albums are similar: They contain “Two Scoops of Shredder,” usually electric, to one scoop of vocals and other instrumentation. They’re also why I’ve added a new category, “Guitar Monster Blues,” to the “Styles” section. Case in point? 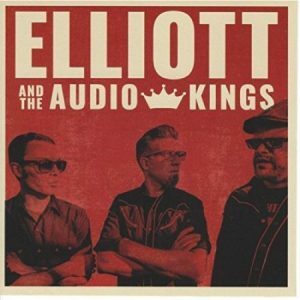 Canada’s Elliott and the Audio Kings’ self-titled debut CD. If you yourself own an electric guitar, plug it in and play along, and if you don’t, put those fingers in the air and start picking. Vocally, lead man Mike Elliott is a bit workmanlike, providing the fiber as a contrast to his fun fretwork. However, if crowds want to party, who’ll care about that? The eleven original tracks will be perfect for upcoming outdoor summer festivals. On their website, this take-no-prisoners trio tells it like it is: “Standing on the bedrock of the blues recorded by the post-war masters, Elliott and the Audio Kings are building on that foundation, with their own brand of shuffles, boogies and swings. After retiring Daddy Long Legs, Southern Ontario’s most infamous Maple Blues Award-winning garage blues band, guitarist/singer Mike Elliott is back on the blues scene…With Jonny Sauder on drums and Scott Fitzpatrick on doghouse bass, Elliott has taken a step closer to vintage blues. Elliott and [the] Audio Kings’ first release captures all the crash and bang of cut-rate guitars running hot through pawn-shop amps howling off a concrete floor.” They also describe themselves as “old school, not retro.” If you can puzzle out that one, blues buffs, you’re one step ahead of this reviewer. Track 01: “What They Say About You” – It may not be polite to spread rumors, but sometimes they’re facts in disguise. “I know it’s true, what they say about you. You’re messing around, gonna treat me like a fool.” If number one doesn’t get people dancing, nothing will, and if those with two left feet lose the beat, Jonny Sauder’s daring drums will keep them right on track. As always, however, the highlight of this tune (and the other ten) is Mike Elliot’s great git-tar. Elliott and the Audio Kings’ first foray possesses “Two Scoops of Shredder” for those who crave “Guitar Monster Blues” above all else!